Our Grip Guard and Weathertex products are designed to protect your roof. It is a self-adhering membrane composed of a rubberized asphalt roofing sheet with a strong inorganic glass mat for reinforcement. Gripgard's top surface is embedded with fine inorganic granules and the back is covered with an easily removable dual scored plastic release film. For more information on BP Gripgard, visit the BP Product Page. 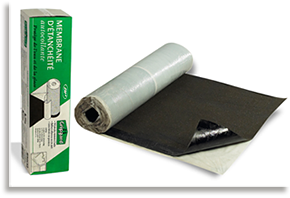 Weathertex is a self-sealing membrane for roofing eave protection, valley, hip and ridge, the perimeter of the roof and all protruding elements on the roof against ice and water infiltration. For more information on BP Weathertex, visit the BP Product Page.